Whitby Town manager Darren Williams was left frustrated after his side were held to a 0-0 draw at Halesowen. The Seasiders chief feels his side should have won Saturday’s game after creating a number of goalscoring opportunities in the second period, and also bemoaned the quality of the playing surface at The Grove. 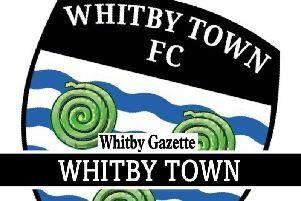 “I can’t say that I’m happy with a point, we should have had all three,” Williams told the Whitby Gazette. “We had the chances to win it in the second half, but their keeper has pulled off some fantastic saves. “We looked the better side but the pitch was a real leveller, it was horrendous. After a dour first half, the Blues were on top after the break and went close to taking the lead when substitute Ryan Brobbel had a free-kick pushed over the bar by Halesowen stopper Daniel Platt. James Brown’s shot was blocked at the near post and Dave McTiernan saw a close-range strike turned over as Whitby turned the screw. Brobbel, who Williams felt “changed the game” when he arrived from the bench midway through the second half, then beat a couple of defenders before forcing Platt into another fine save. The former Middlesbough man, who was playing in League Two for Hartlepool United last season, signed for the Blues last week and Williams admitted that he is delighted by the immediate impression that the midfielder has made. “Ryan did very well when he came on, we were just starting to go a little bit flat and he livened things up, he helped change the game,” Williams added. Town are back in action when they travel to Workington tomorrow (Tuesday) for a 7.45 kick off. Williams revealed that the Blues have no new injury concerns ahead of the game and is hopeful that his side will be at full-strength. “Everyone should be fit for Workington, the only issue we have is whether all the lads can leave work early enough to get there in time,” he continued. “I don’t know who thinks that sending us to Workington for a night game in midweek is a good idea, but it’s a bit of a nightmare for us. “It’s a long trip, but we go there confident of getting a result. I think that we can beat anyone in this league, but only if we apply ourselves in the proper fashion. A supporters’ coach departs the Turnbull Ground for Workington at 2.30pm on Tuesday. To book a place contact Graham Manser on 07966 241344.